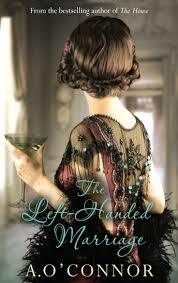 BleachHouseLibrary.ie: #IrishFictionFortnight - Day 6 - "The Left-Handed Marriage by A. O'Connor. 3 PB editions to Giveaway. #IrishFictionFortnight - Day 6 - "The Left-Handed Marriage by A. O'Connor. 3 PB editions to Giveaway. Thanks to Poolbeg Books, there is a copy of this stunning novel, from historical fiction author, A. O'Connor, to Giveaway. Just enter via rafflecopter link below. Good Luck! Irish beauty Diana Cantwell meets charming Max Von Hoffsten, eldest son and heir to a German count, and their romance blossoms in the carefree days before the First World War. But when they become engaged, Max’s father insists on a ‘left-handed marriage’, a custom among the German aristocracy in cases where the bride does not have the required pedigree. This means that, although Diana will be Max’s lawful wife, neither she nor their children will have any claim to Max’s eventual title or wealth. Deeply in love, Max and Diana agree to these terms and the newlyweds dazzle from Ascot to the Riviera and host lavish skiing parties at their estate in the Alps. However, as the dark clouds of war gather across Europe, Diana becomes concerned by her loving husband’s unpredictability and what she suspects are sinister secrets beneath his family’s glamorous lifestyle. When war is declared Diana finds herself caught between two sides, as her own Anglo-Irish family are fighting for the British and Max is an officer in the German army. Diana, refusing to leave her beloved husband, becomes a figure of mistrust in Germany and is portrayed as a treasonous woman in the British press. When Max is reported missing presumed dead, Diana is rejected by his family. Widowed, penniless, her reputation in tatters and her own family in Ireland destroyed by the war, Diana sets out to rebuild her life. The Left-Handed Marriage is published by Poolbeg Books and is available in paperback and ebook format.